I've been thinking about buying a terabyte hard drive. Right now I have a 500GB drive. Are the terabyte drives as fast and reliable as smaller drives? Should You Buy a Terabyte Hard Drive? Hard drive storage is cheap and plentiful these days. Your typical desktop PC usually comes with at least 300 GB of hard drive space. Of course, hard drives that have a terabyte (1000 GB) or more of space are available as well, and prices seem to be falling every week. The average street price for a 1.0 TB drive is under $100. But do you really need that much disk space? It depends on what you want to stash on your hard drive. I've got a 2-year-old XP system with a 500GB drive and plenty of bells and whistles. Since I'm your typical geeky power user type, I download a lot of software. I've got an iTunes library with a couple hundred songs, and I store thousands of photo and image files. But when I checked my stats, I was surprised to see that I'm only using about 50GB of space! Terabyte drives have increased in popularity because online entertainment and the Youtube generation means massive amounts of multimedia files such as music, video and images. With that said, your typical computer user would still be hard pressed to fill up an entire terabyte of hard drive space. But the past few decades have taught me that as computing power and storage capacity increase, operating systems, software and new technologies will spring up to consume them. As HD (high-definition) video becomes more common, and the convergence of television and computers continues, we may be filling up those terabytes with ease. Another excellent use for a terabyte hard drive is backup storage for all the computers on your home network. Are there any another benefits of downsides to having large capacity storage? Used to be, larger drives had performance issues, in particular drives that used the older IDE/ATA interface standard. IDE/ATA in general refers to the type of connector, or interface the hard drive uses to attach to the motherboards. IDE drives took longer to write to the disk and are not hot swappable, meaning in case of drive failure, you couldn't simple swap one drive out for another working one without downtime and some configuration. IDE became more inefficient as the demand for storage space increased. The latest iteration in hard drive interface is SATA, or serial ATA. The SATA interface gives better performance, and SATA drives are hot swappable, so drives can be replaced without a computer restart. Because of this new architecture and overall advances in hard drive technology, terabyte drives can be an efficient way to deal with large amounts of data. While the consensus is that these new drive offerings have low failure rates, they're still relatively new. We don't have millions of consumers routinely juggling 1000+ gigabytes, so hopefully these monster drives will perform equally well when they're approaching 80 or 90 capacity. Hard drive manufacturers say "don't worry about it" but some may question if it's better to go with one single, massive hard drive, or is it better to have two smaller disks, for example two 500 GB drives? I've heard some people caution that if you put your data on a terabyte drive (as opposed to having two or more smaller disks) then you have a single point of failure, and a larger disk would logically be more likely to develop a hardware problem. But I'm sure that people had the same qualms about moving from megabytes to gigabytes, and the reliability of computer hardware is always improving. Operating system support for terabyte drives seems to be solid. Latter day operating systems like XP, Vista, Linux and Mac OS X can handle a 1 TB drive with ease. The NTFS file system used by Windows-based computers can support drives up to 16 exabytes, which is 16 million terabytes. Tthere have been however, some issues reported with some flavors of Ubuntu and Vista 64-bit having problems with some of the 1.5 TB drives out there. Another consideration when it comes to terabyte drives is the performance of disk utility programs, like Defrag. There have been countless horror stories of the length of time it can take for Windows to defrag such a large drive. This should still not be a deterrent to investing in a large-capacity drive; there are an abundance of third-party applications like Diskeeper, which can defrag a large drive in the background of a running operating system, with no intervention by the end-user. Even formatting, using the Windows Option for "Quick Format" can take no more than a few minutes when it comes to large capacity drives. In other words, the negatives associated with terabyte hard drives are outweighed by the benefits of large, relatively cheap storage. The demand for high capacity storage is there, and it isn't stopping with just terabyte drives. It is anticipated that within the next ten years, cheap hard drives with a petabyte of space will be available. A petabyte is 1000 terabytes of space. To put that in perspective, the Library of Congress estimates that all of its collective data would fit on twenty terabytes of space! Do you have a terabyte hard drive? Post a comment, tell us what you're doing with all that storage, and whether you've had any problems dealing with a terabyte of disk space. Most recent comments on "Terabyte Hard Drives"
Excellent overview Bob! I especially enjoyed the way you delved into the differences between RAID versus a single drive. Thanks! As I am an avid collector of movies a terabyte hd is a God send to me. I now have four 1 terabyte drives hooked to two computer systems and have a 5th on order just to store all my movies (present & future) as well as the 18000+ songs I have collected over time. So far, so good with no failures. But I do keep careful track of what's on an individual drive so if it does fail (Oh, please! I hope not!) at least I know what I have to replace. Hi Bob: Your overviews are excellent ! I have a la LaCie Terabyte HD where I load my videos, and it's working flawlessly, for the last 4 months. @Tom Smith - you should look into getting a Drobo so that you don't have to worry about drive failures. I currently have a Drobo with three 750Gb drives and one 250Gb. It is wired into my router with the NAS kit that they sell for it. I use it as my bulk storage unit for pictures & videos and for the incremental backups (using Acronis) that I run on all of the computers (2 DTs, 1 LT) on my home network. It takes care of defragging and monitors the health of all my drives. It is a bit pricey (about $400 w/o the drives), but well worth it in terms of securing my data and not having to worry about it. It will also take up to four, 4-Terabyte drives. Thanks for the post Bob. Very informative. My local HDD supplier informs me that ATA disks are a thing of the past? So you have to have a SATA interface of some description. Could you possibly update us on this. EDITOR'S NOTE: It's true that new computers mostly use SATA. But there are plenty of older computers around with motherboards that need the IDE interface. CAUTION- TB drives present an interesting concern! ALL DRIVES FAIL! Like sump pumps, all drives fail it is only a question of when. Backup is NOT the prime issue but RECOVERY is. The bigger the drive, the longer to backup and even longer to recover. Based on decades of "failure" experience, the OS drive should not be on a partitioned TB drive. The OS drive should be on a drive that is easy to backup and even faster to recover! TB drives are great (I have many) but almost every TB drive (internal and external) is synced to a backup TB drive. When a TB drive fails, I buy another and then re copy from the good one. I am out some time, but do not loose data. Today, storage is almost unlimited and almost free but it will fail so RECOVERY is the key action that MUST be tested so when you need it, you will be ready! I should get a terabyte drive. I've been using my computer to record and watch HDTV the past three seasons and 500 gig drives fill up way too quickly. It turned out I'd keep more of the recorded shows than I expected to: because it seemed as if those shows would never make it to home video release in DVD let alone hi-def. I recently got a terabyte and I can not put my OS on it. It keeps coming up as BOOT MGR is missing. Won't even go through the install at all. I already have a 500g hard drive on my computer, and there is about 100g left. Was wondering if it's my computer that can't handle it or something else. Anyone who can help would be gr8. Need more space on my computer. Checked around on the net and can't come up with a answer. EDITOR'S NOTE: Has the drive been formatted? 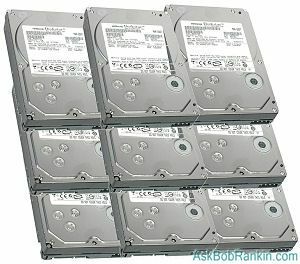 I boiled it down to getting a Samsung or Hitachi 1 Terabyte internal hard drive to replace my Seagate Barracuda 750GB and use it as a backup to store in a safety deposit box (photos, documents, etc.) for safe keeping. From what I've been reading, it's about reliability, speed, heat output, energy consumption, and warranty. It's so complicated. Please help me figure which one is best. EDITOR'S NOTE: Sounds like you have a bad case of analysis paralysis. Pick one. I bought a Seagate 1 TB SATA internal drive last month, encased it in an external USB enclosure - though it does need to be AC powered by an adapter - been working OK, but of course, it's just been a month. I made 4 primary partitions on it. 1st pri is a 2 GB I use as Windows' Temp folder partition. 2nd & 3rd pri I intend to use to install Linux on. On the 4th pri I made 4 logical drives of 220 GB each for video files, image files, binaries (setups of programs & applications etc) and finally, music & ebook collection on the last logical drive. Populated it by transferring data off an Iomega 250 GB external which was causing write errors. Already the video files partition is 67% filled. I caught the tourbus when it first started and haven't got off yet! Thanks for all the effort. Re TB drives; I lost a system this week and have added a terabyte drive. This gives me a second location to store system images. I have an online Maxtor 1TB as well, together with a 300G USB drive. This gives me two large areas on which to store duplicate copies of my Acronis images, and the 300 allows me to keep the latest images off site. I'm a consulting Engineer which with important data going back 10 years and I couldn't afford a major data loss - much less the pain of re-creating systems and apps. Hi Bob this is very useful information I have build about 4 pc's for myself and one thing that I hated is going up in hdd space I would fill them up and than forced to get a bigger one so my last build 4 years ago I stared with a 250gb and guess what is full jut on my Ipod I have over 15,000 songs and with that comes videos , movies and pictures so I decided to have my 250gb and 2 500gb , Ihope that should be enough but with the advent of HD I do think 1tb will not be enough !! p.s I love all the great info you put out there for free . I'm glad I found your site !! I have a Lenovo Y510 Notebook that has a "one key"
recovery button which was pushed incorrectly by the user, instead of the power button. The computer will not start properly now. it warns me that it will repartition the C: drive to recover??? Not something that sounds good! I bought a Western Digital 2TB "MyBook Mirror" about a year ago. Set it for the default RAID and it's run flawlessly ever since. Yes it will fail as all hard drives eventually do. It has two mirrored copies and the odds of both going at the same moment are zero! (I keep spares). Drop in a fresh drive and it rebuilds. Hard drives are consumable products like ink cartridges with a MTBF of around three years. Once one gets their head around that fact you will save yourself a lot of grief. I say bring back the 40 GB drive. I like to keep my boot hard drive small to allow for periodic imaging which saves a lot of time and trouble in the event of its failure. Larger drives are used for file storage and those files are synced to another system that acts as a simple file server with a pair of drives mirrored using a raid card. I realize that there are a lot of slim line systems that do not allow room for more than one hard drive, but as I build my own, I ensure that the cases I use are able to hold several drives. I am going to buy an external 1 TB hard disk since I am using my computer to download bulky softwares and videos from you tube . But people say 1 TB hard disks are very prone to failures and crashes. So it makes me more confusion to buy 1 TB hdd, please help me to choose whetehr I should buy a TB hdd or just 500 GB hdd. I have a Hitachi 2 TB external hard drive, a slow IBM T43 laptop (2005), around 75,000 files (90% videos, over 350 MB each), free hard disk space is 250 GB. After, I use window XP cleanmgr and compress old files (around 600 GB) and it take 5 days to complete, the hard drive, became heavy fragmented. Then, I use TuneUp Drive Defrag 2011, running thorough defragmentation, it take around 20 days (24 hours a day) to complete !